President Obama on Thursday dismissed criticism that he is responsible for the rise of Donald Trump and what he called the "crackup" and "circus" within the Republican Party. "I have been blamed by Republicans for a lot of things...but being blamed for their primaries and who they're selecting for their party is novel," Mr. Obama said in response to a question from CBS News' Margaret Brennan at a joint press conference in the White House Rose Garden with Canadian Prime Minister Justin Trudeau. The president reiterated that he regrets not doing more to tone down the polarization in politics and in Washington since he took office in 2009, but he said it's "Republican political elites" and the media that have been "feeding the Republican base for the last seven years a notion that everything I do is to be opposed." Mr. Obama rejected the idea that he has contributed to the nastiness of today's politics, and said, for example, that he didn't prompt GOP efforts to question his own birth certificate. "Those weren't prompted by any actions of mine," he said. "What you're seeing within the Republican Party, is to some degree, all of those efforts over a course of time creating an environment where somebody like a Donald Trump can thrive." His job as president, he said, it to bridge divides and help Americans find common ground. "What I'm not going to do is to validate some notion that the Republican crackup that's been taking place is a consequence of actions that I've taken," said Mr. Obama, who then called on Republicans to "do some introspection" to understand what has allowed "the circus that we've been seeing to transpire." Former Louisiana Gov. Bobby Jindal, who dropped out of the presidential race last year, recently wrote an op-ed for The Wall Street Journal that said the president created Trump. Asked if he plans to make an endorsement in the Democratic primary, the president said, "I think the Democratic voters are doing just fine working this out." During the press conference, the president was also asked to again give a sense of the type of person he'll soon nominate to the open Supreme Court seat left by the late Justice Antonin Scalia. The president said he's looking for an "outstanding jurist," someone who has "impeccable credentials," whose qualifications wouldn't even be questioned and someone who would follow the Constitution. "In terms of who I select, I'm going to do my job and then my expectation will be will the Senate do its job," he said. "My hope is that cooler heads will prevail and people will reflect on what's at stake here once a nomination is made." His comments come nearly a month after Scalia's sudden death and after Senate Republicans have already ruled out holding confirmation hearings and a vote for his forthcoming nominee. They have said they want to wait until the next president is sworn in next January. Trudeau is in Washington, D.C. for his first White House state dinner. He was sworn in as Canada's prime minister last November. 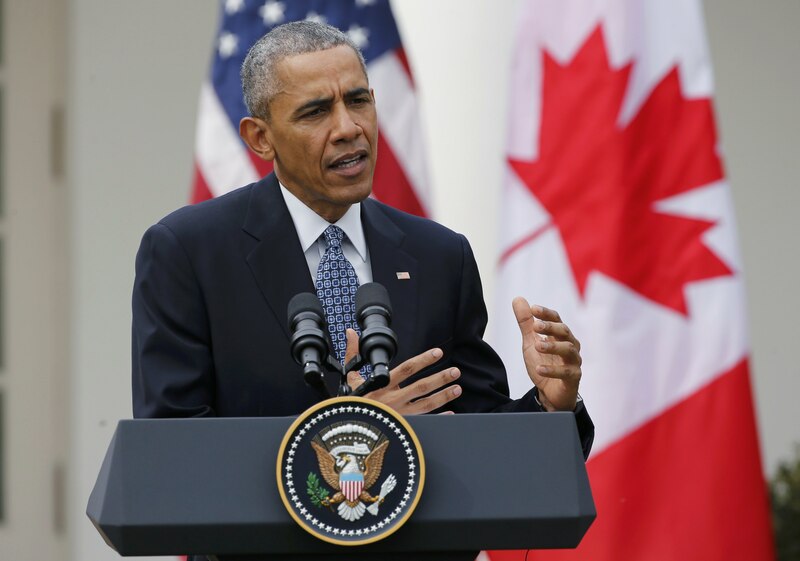 At Trudeau's invitation, Mr. Obama said he looks forward to addressing the Canadian parliament this summer.